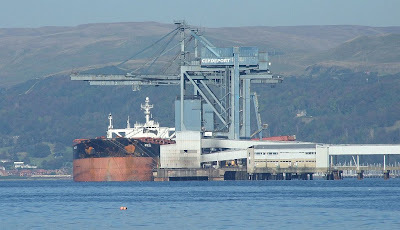 Seen at Hunterston today completing her discharge of coal, loaded at Richards Bay at the end of August, was the bulk carrier GO PATORO, a 1991-built ship of 150,108 tonnes deadweight. GO PATORO, originally named NORD-POWER then renamed DEEP BLUE in 2001 and WELFAIR in 2005, joined the fleet of Global Oceanic Carriers Ltd in October 2006 and is now registered at Limassol in Cyprus. She is 269 metres overall, with a 43 metre beam and 17.41 metres draft. She was constructed by Hyundai Heavy Industries at Ulsan in Korea, and is fitted with a 5-cylinder Burmeister & Wain engine producing 17,450 bhp at 88 rpm. Her service speed is in the order of 13 knots. In June this year, she commenced a three-year charter, with the present daily charter rate being $32,000, although this reduces in the second and third years.